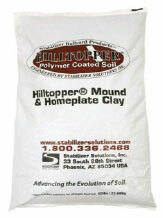 Hilltopper® Clay replaces needed moisture content with patented polymer technology. This eliminates the need for water and the variability that occurs from water. Simply spread and tamp right out of the bag. The Hilltopper Clay will shed water and keep you playing throughout rain, snow, or drought. 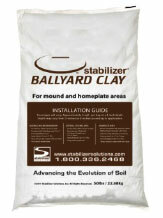 Stabilizer® Ballyard Clay is a manufactured blend of clay, interlocking soil particles, and Stabilizer®. No longer will your mound turn to mud. This stabilized mound clay is designed to manage moisture for you, it remains stable during rain events and holds onto water longer in dry periods. 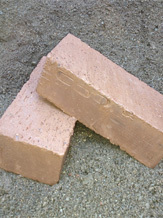 Compacted, unfired, and moist clay bricks are a simple and economical way to build or repair a pitcher's mound or batter's box. 300 bricks per pallet.